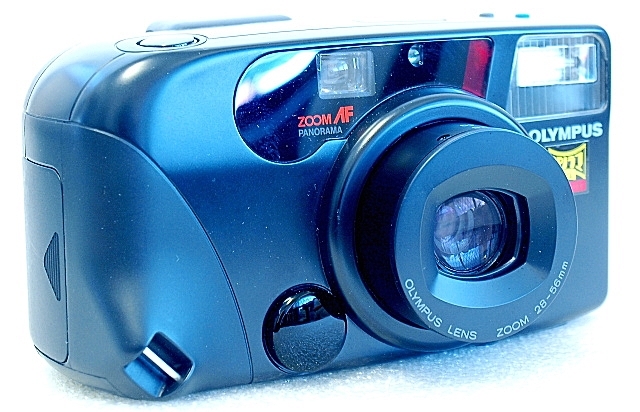 While I am still on the search for a competent compact 35mm film camera with a 28mm wide-angle lens which I prefer to lug around as a street-shooter, I have to admit that the Olympus IZM 220 AF Panorama Zoom, aside from the Fuji Work Record OP, is a candidate that looks keen enough for the keep. 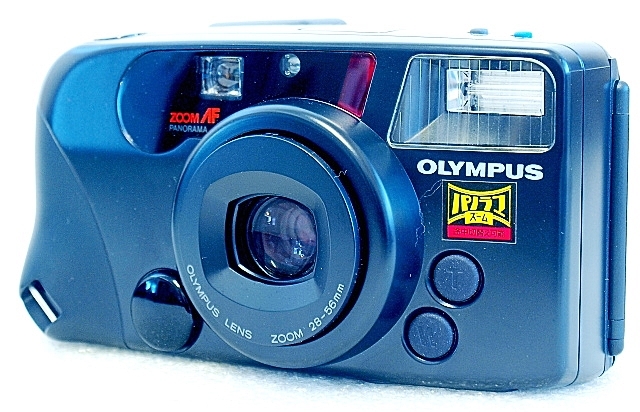 Basically, the Olympus IZM220 is a programmed electronic shutter 35mm autofocus film camera fitted with an Olympus 28-56mm F3.5~6.5 8 elements in 7 groups zoom lens. Complementing the setup are a two-button motorized zoom, two-zone autoexposure metering, DX decoding, and a built-in variable power auto-flash. Feature rich, the on-the-fly panorama feature is supported by a switchable Kepler type zoom viewfinder with autofocus frame, close-up correction marks, autofocus indicator and flash indicator, and diopter correction. 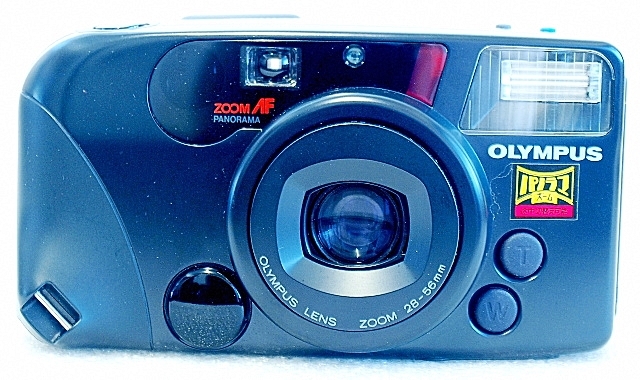 The IZM 220 is part of Olympus's Infinity AZ Super Zoom/IZM series which was in production from 1988 to 1992. 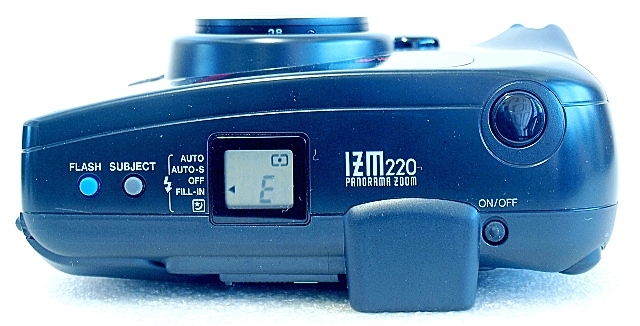 The IZ M220 is also marketed as the AZ220 Superzoom or Infinity Zoom 220. Camera body weight is 345 grams without battery. Uploaded by ThisRetroLife??? on 2018-12-07. 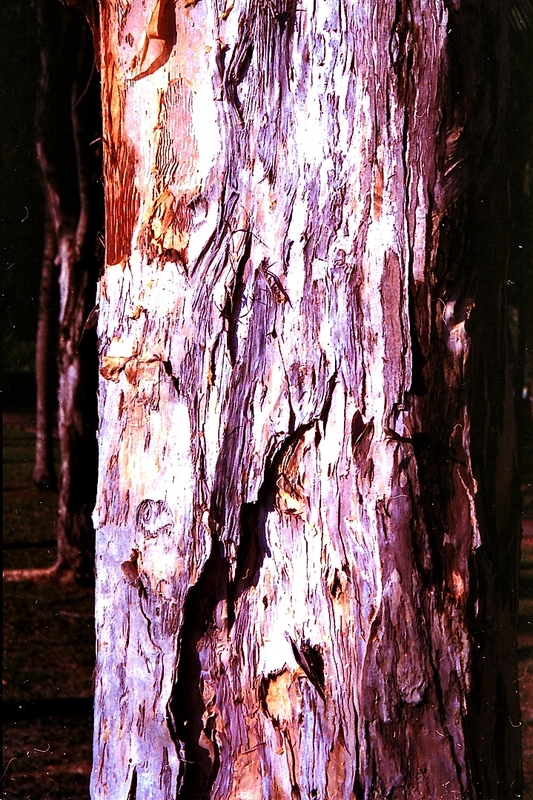 An added extra on the IZM 220, not easily found among other compacts of this genre, is the 2-zone autoexposure metering, a center-weighted average light metering which is switchable to spot metering. 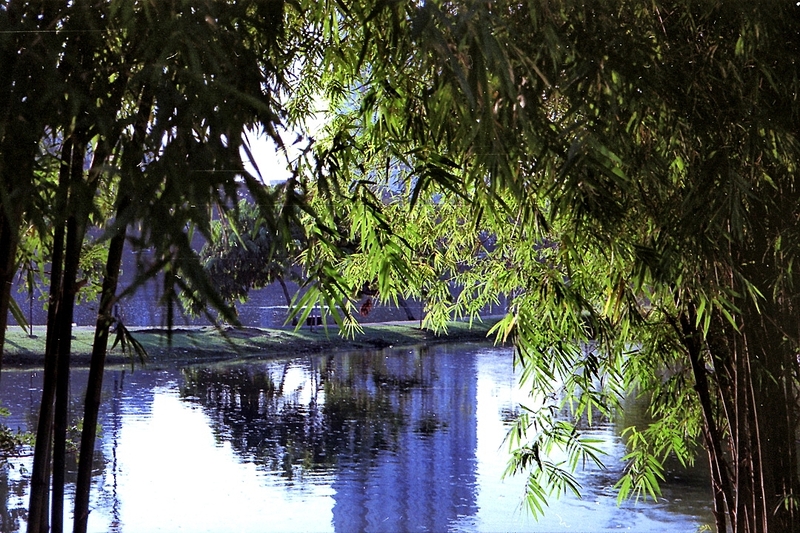 Auto exposure range is progressive from F3.5, 2 seconds to F8.4, 1/500 second at the 28mm wide-angle end, and from F3.5, 2 seconds to F8.4, 1/500 second at the 56mm telephoto zoom end. Not a true compact which you can easily slide in and out of your pocket, the rather squarish IZM 220 has the bulk of a wedged shaped brick with a weight to match. It is, however, comfortable in your hand with the snout-shaped strap eyelet on the lower left corner functioning well as a finger rest. The front of the camera is a bevy of buttons and bells. An iris protected lens and the lens housing mount is almost central to the front panel, one of the two autofocus triangulation windows located just to its lower left. 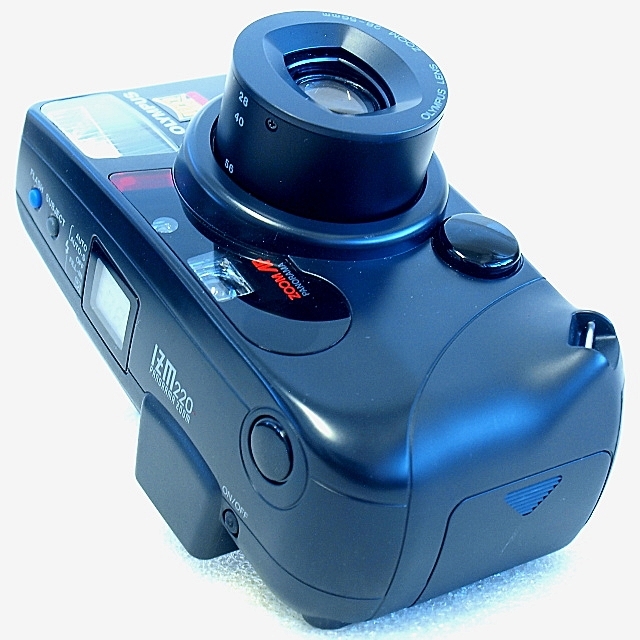 A pair of zoom buttons, one each for Zoom-In and Zoom-Out functions, flanked the opposite of the lens housing mount. 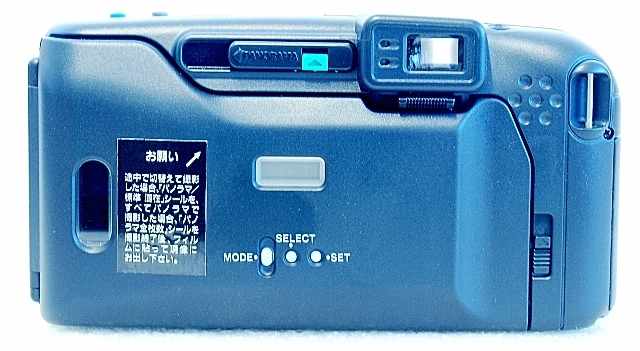 The strip along the top of the front plane carries, from left to right, the other autofocus triangulation window, viewfinder window, the AE light sensor, and the flash unit. 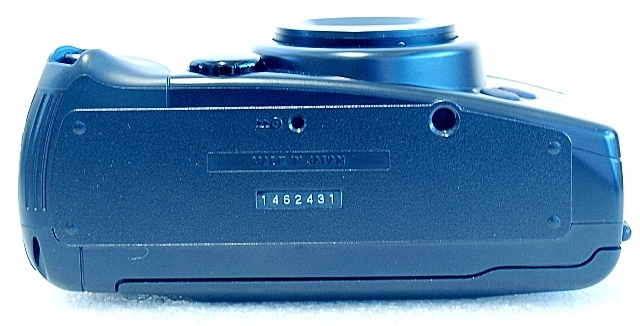 On the top plane of the camera, from left to right, a pair of small mode selector buttons next to which is the LCD panel, and to the right, the viewfinder hump, the power switch next to it, and the shutter release button towards the front right corner. On the backplane, the film back with a film ID window and Quartz date LCD panel and selector switches on the film back itself. The film back is released by a latch just to the right of the film back opening. Above the film back opening is the panorama switch lever, and the viewfinder with a pair of Green/Orange LED indicators. On the bottom, the midroll rewind button and tripod socket. The film box is a typical quick load type where all you need to do is to ensure that the film tab is pulled flat across the film frame opening to line up to the indicated red mark at the pickup spool area before closing the back. 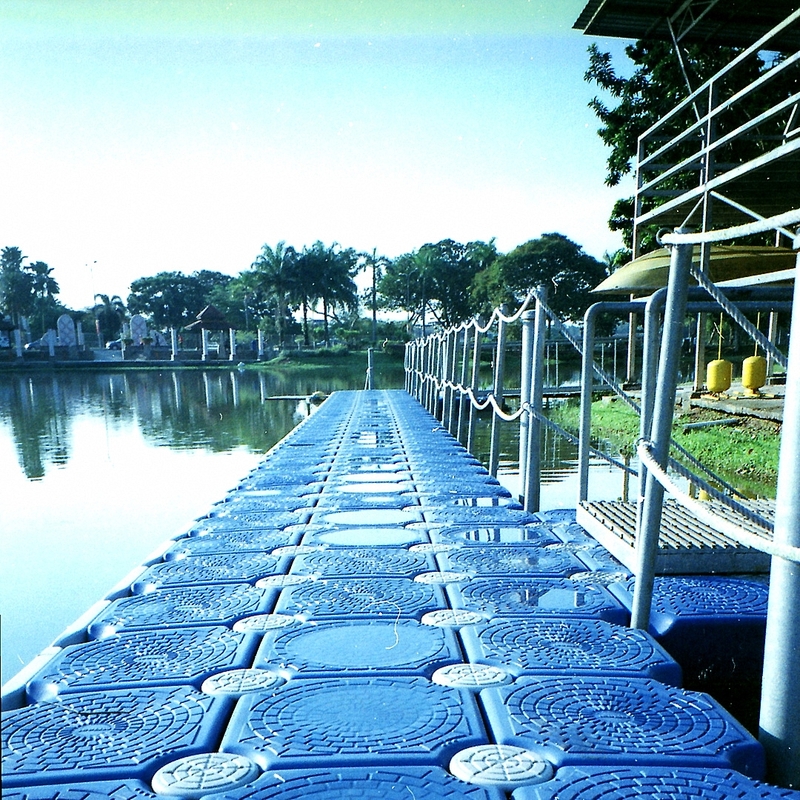 The film is then automatically wound to frame 1 by the motorized film advance system. Film rewind is automatic at the end of the roll. The viewfinder is a panorama-standard switchable Kepler type zoom viewfinder with autofocus frame that doubles as the spot-metering frame when selected, and a single parallax correction lines. On the periphery is a couple of Orange and Green LED indicators - Orange for flash ready and Green for focus lock. The two-mode cyclic selector buttons are for Flash and Feature modes. Flash modes - Auto, Auto-S, Flash Off, Fill-In, and Backlighting. Feature modes - Self-Timer, Continuous Mode, Dual Frame Self-Timer, and Spot Metering. The LCD will display arrowhead ticks to match the Flash mode setting, option setting for Self-Timer, Continuous mode, Dual frame self-timer, and Spot metering, film frame counter, and battery strength. The IZM 220 requires a pair of CR123A lithium batteries to operate. 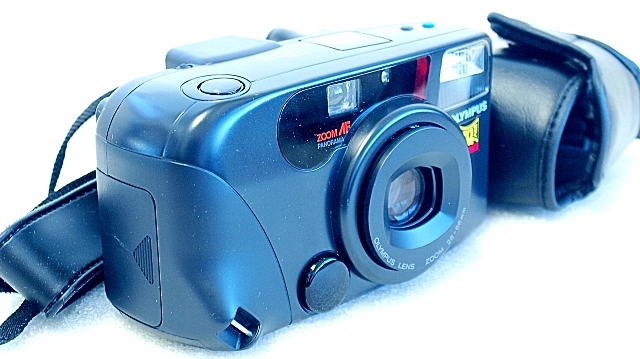 As with the rest of AE autofocus camera of the era, the Olympus IZM 220 35mm Panorama Zoom, aside from requiring a two-handed operation for zoom, is easy and fun to use. 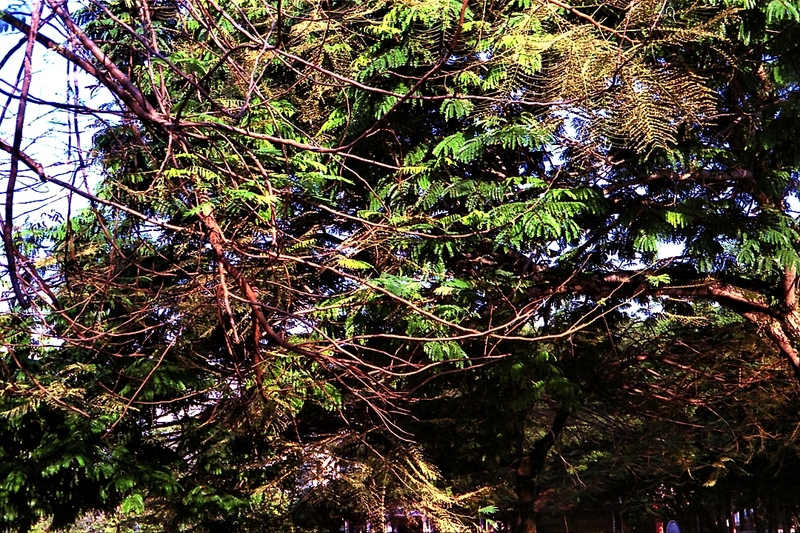 Treat it just like a normal point-and-shoot are you are in for a great picture taking experience. 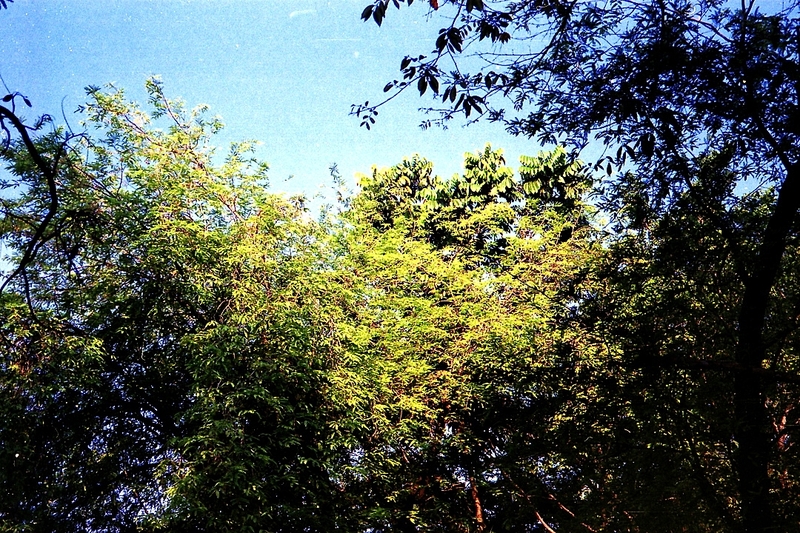 Switching to panorama mode, a feature common with cameras from the same era, can be done on-the-fly, via an external lever switch located just left of the viewfinder. 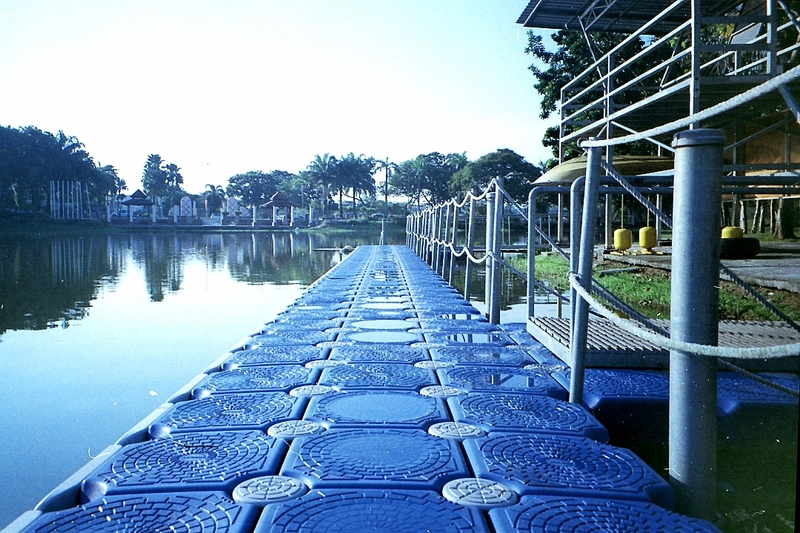 Though handy, this feature may look rather redundant today, as images can be cropped to the desired image aspect during post-processing. But regardless, it is good to know that the feature is there if you may want to use it. Camera operation is very quiet, nothing overly audible, a soft whirr, a click, a clunk, and all is done. That is what you hear, hardly noticeable in the hustle and bustle of a crowded city street, the boulevard, a dark dead-end alley, or anywhere it good to shoot with a 28mm wide-angle lens. 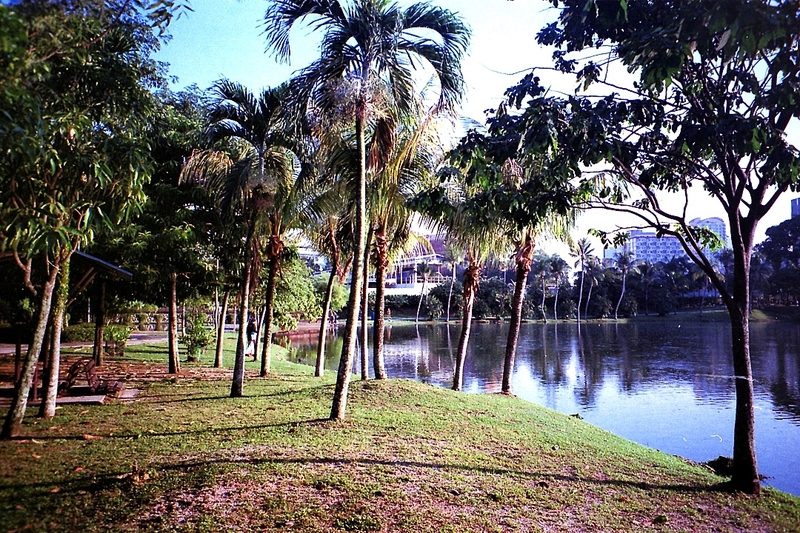 For these early images, I was down in the park for these landscape shots. It was early and bright, the sun was still low, and with not too many people around, I almost had the park to myself. Whilst I did not delve into spot-metering or the panorama modes for these shots, that will be for another session, images from both ends of the zoom are pretty sharp and do look good after a few tweaks on the post-processing app. 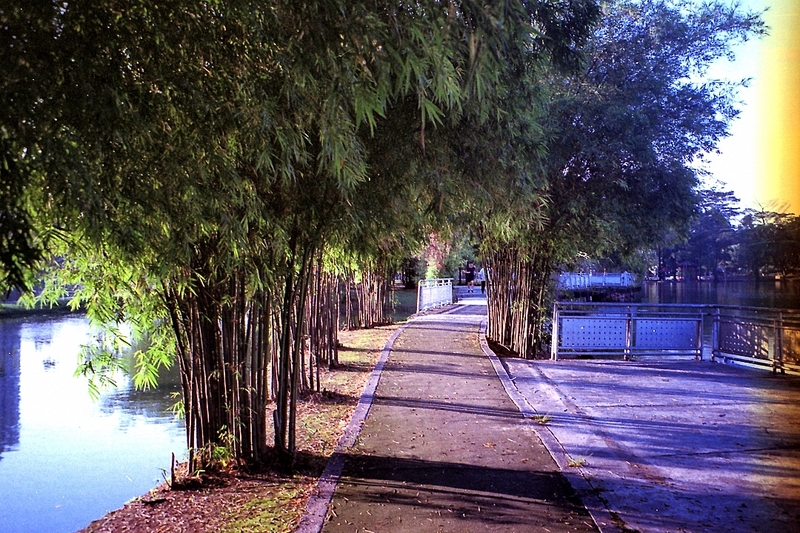 I was using an almost expired roll of Kodak Colorplus 200 here, post-processing was on Olympus Viewer 3 (OV3), and final print sharpening was on Google NIK Sharpener Pro3. 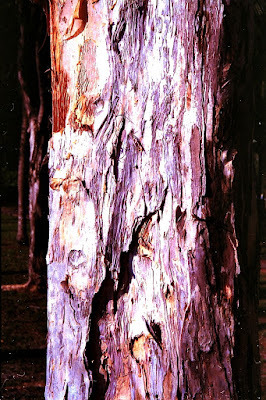 Scanning was on the Canon CanoScan 9000F Mark II at 2400 dpi and these images are posted at 1080 pixels on the long width. Well, while some are still gung-ho over the likes the Olympus Mju II, Olympus XA, or the Trip 35, for their image quality, one might just as well accept that the Olympus IZM 220 AF Panorama Zoom is an equally striking in its ability as a feature-rich wide-angle to normal compact AF zoom camera, well worth the bid and freight charges that you are going for.